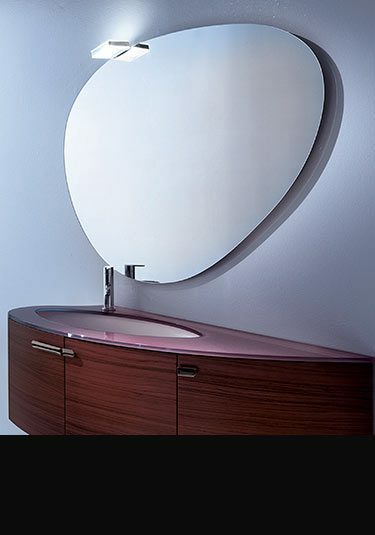 Please browse our beautiful collection of contemporary bathroom mirrors in round, square rectangular and oval designs. 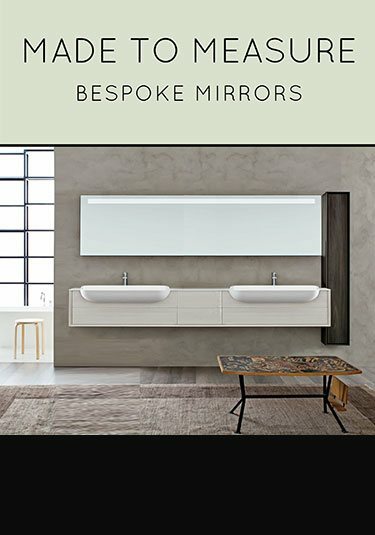 We offer luxury bathroom mirrors in the latest designs made with aluminium, stainless steel and coloured glass surround frames. 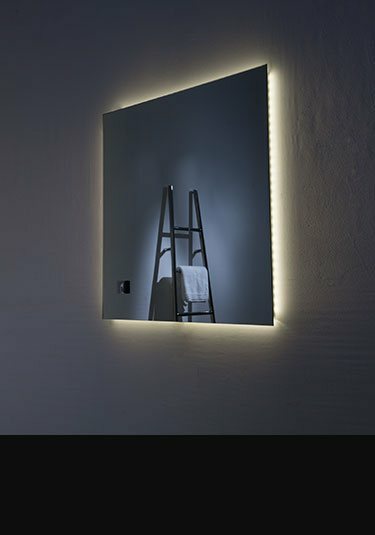 Our designer bathroom mirrors can be supplied illuminated with low energy lights, we have mirrors with built in magnifying mirrors allowing for easy make up and safe shaving. 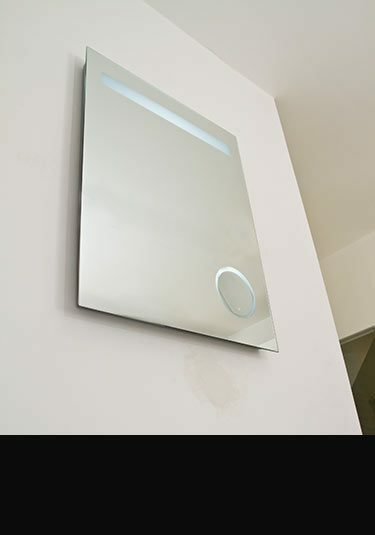 We have luxury mirrors using the latest technology such as mirrors with heat pads allowing for steam free viewing because of the heated mirror properties. 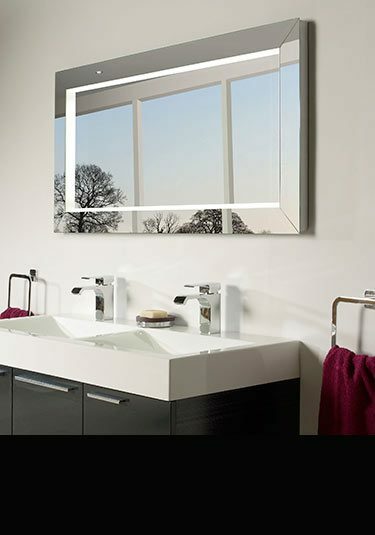 We also offer contemporary bathroom mirrors with built in clocks, radios and shaver sockets. 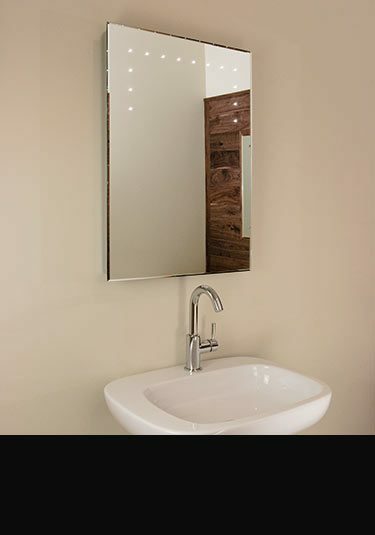 If you require a mirror in a special size, we offer made to measure bathroom mirrors in our clients custom sizes. These bespoke mirrors can be supplied with lights as well as without. Our illuminated versions can have swan neck lighting, lighting within the actual mirror as well bathroom mirrors with a backlit frame. A bathroom mirror with a light and a scary magnifying mirror which is also illuminated. Each shaving / make up mirror is sensor switched and the mirror heated for condensation steam free viewing. A bathroom mirror with nearly everything. 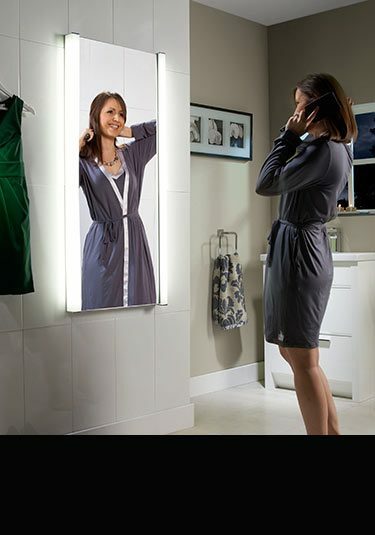 This contemporary mirror has LED lights, fm radio, digital clock which is alarmed and a remore control handset. 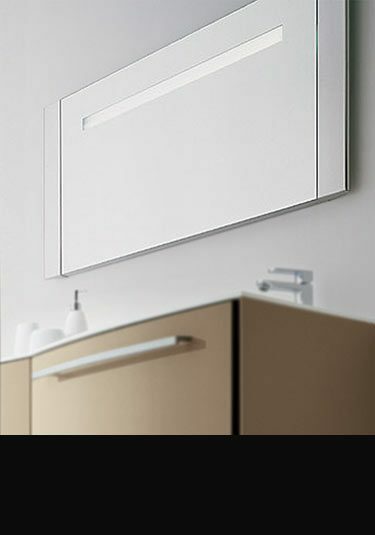 High quality Italian designed and manufactured bathroom mirror. 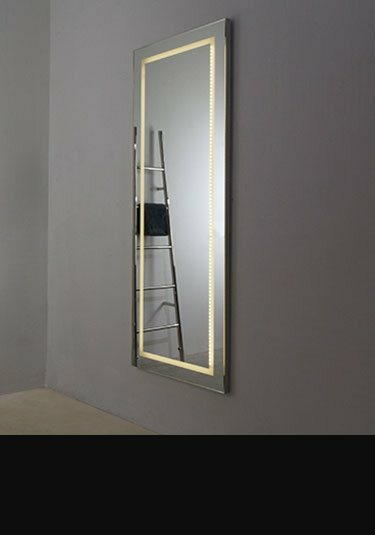 This designer mirror has a stainless steel frame with the mirror illuminated via an intergrated strip light. 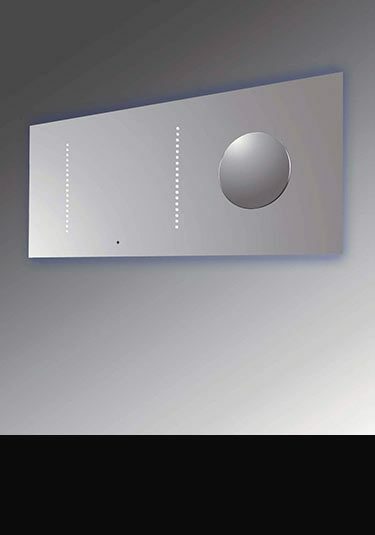 Available in 4 sizes this heated mirror has a heat pad for condensation free viewing and 2 side strip lamps for illumination. All operated with a infra red sensor switch. 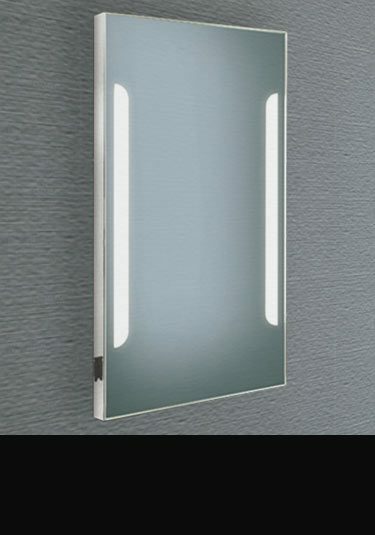 A contemporary framed bathroom mirror with a stylish rectangular integral light. This mirror has a chrome frame and the mirror is heated for steam free viewing. Stylish glass mirror finished in gloss black with a nice and small minimalist overhanging light. This classical styled bathroom mirror is a luxury addition to design led bathrooms. This re-chargeable bathroom mirror does not require a mains power supply. The long lasting battery pack is simply re-charged when required and a charge can last up to a month. Mirror is available in 3 sizes. Italian designer mirror with a beautiful halo of soft light given off from the edges and sides. 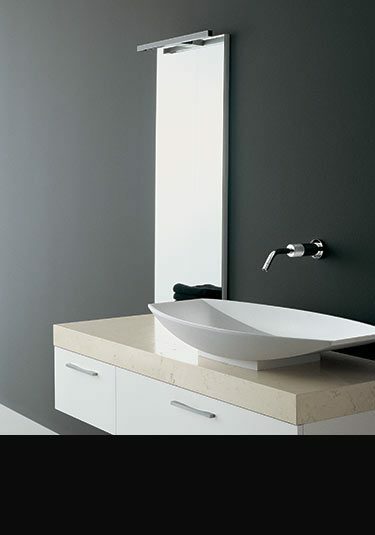 This contemporary bathroom mirror is available in round and square versions. 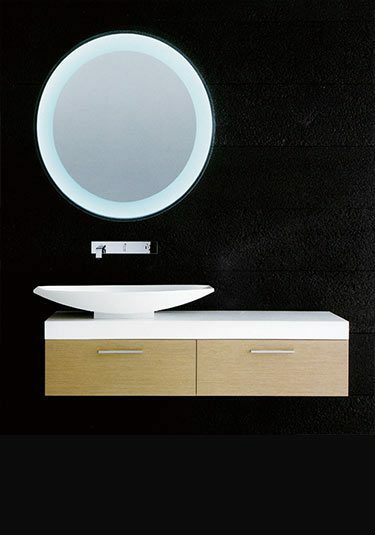 Contemporary styled bathroom mirror that has LED illuminating lights and an stylish inset make up cosmetic mirror which is 3 times magnifying. 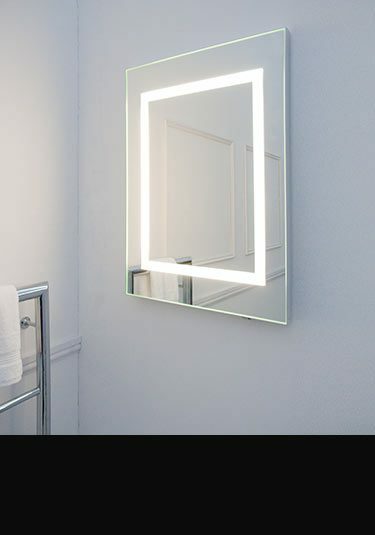 Simple but effective contemporary styling, this mirror has 2 in mirror lighting tubes which are sensor operated, a heat pad for steam free viewing and a shaver socket. A lovely quality bathroom mirror with a mirrored frame that is illuminated on all 4 edges. Each chic mirror is heated for condesation free viewing and sensor light switching which is also energy saving. 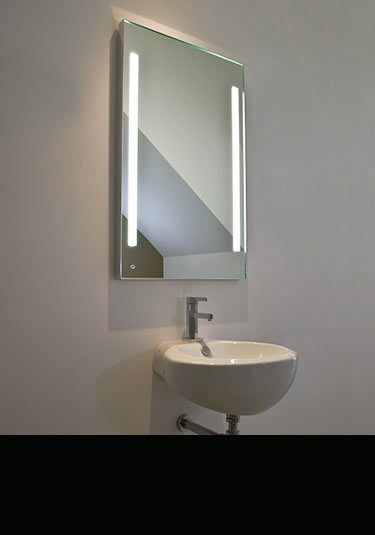 An excellent quality bathroom mirror with 2 integral lights. 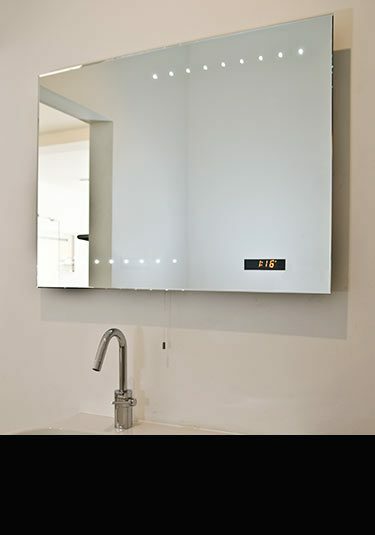 This mirror has sensor and timer switching and a heat pad mirror for condensation free viewing. 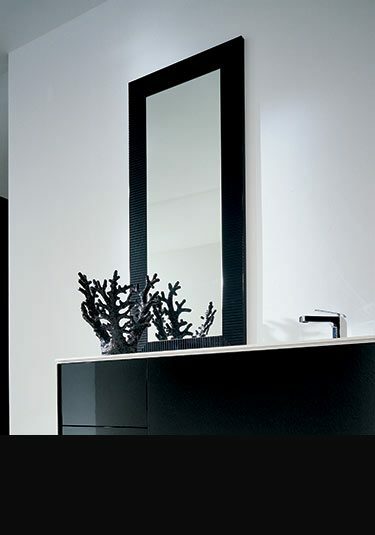 A lovely designer bathroom mirror that is definitly a luxury addition to design led bathrooms. This oval egg shaped mirror has a small contemporary styled light, all adding to the clean cut design. 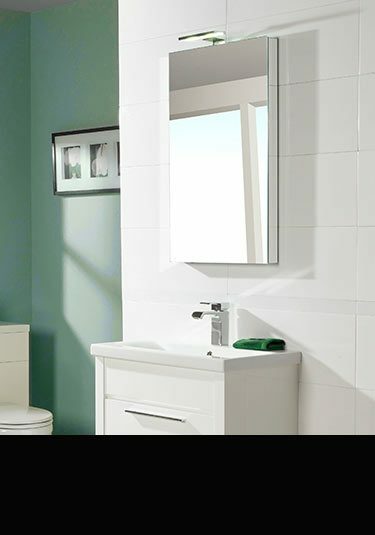 A contemporary styled bathroom mirror with a slimline aluminium frame. This mirror has energy saving lights that are sensor activated and a handy heat pad for steam free viewing in a steamy bathroom.